See those ugly bushes in front of my house? They’re history. Yardwork for the win. Man, do I hate yardwork. I’m serious. Ask my parents about the amount of griping I did when it was time to mow the lawn or what have you. I still can’t stand it, either. One of the most irritating things for me is to have to mow, or weed, or what have you. I know some people love making their lawns look all beautiful and such, but to me there are few bigger wastes of time and energy. So this past weekend, I did yardwork. Yeah, it’s true. And, believe it or not, I actually enjoyed it, because I made myself a challenge of doing it entirely without power tools. That’s right. I made it harder for myself on purpose. 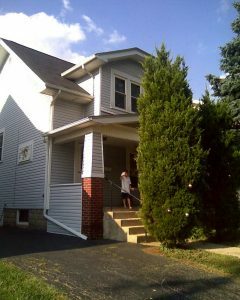 Take a look at the picture here: that’s my house. That’s my son waving at you. And those big, ugly bushes in the front of my steps (with Christmas ornaments on them, yes. Don’t judge me, my kids asked to keep them up) are no longer looming over my front stoop. This picture is about five years old, and since then they’d grown out of control, up past my ability and inclination to take care of them properly. They’d pretty much turned into a small, evergreen tunnel that the mailman or whoever decided to come up our front porch would have to do the limbo to get past. So yesterday, they became history. I pulled out my folding saw and went to work. First thing I discovered was that the folding saw was not the right tool for the job. My neighbor saw me working and offered me the use of a reciprocating saw that he had at his shop, and I accepted at that point, realizing that the saw I had wasn’t working for this job. He had to run down for some work that afternoon, but he’d bring it back to do the work later. Bush #1 is down… and covering my driveway. Well, I wasn’t going to stop because, by gum, I wanted those eyesores to be history. I ended up getting the first bush down with the saw, but it took a really long time. And it was really heavy. I ended up having to have my wife help me more or less pivot and roll it onto our sidewalk just so she could park the car. So at that point, I had the bushes down. And that was the real work, believe it or not. The saw I had been using (which literally cost around $5.00 at Aldi) was just the thing for pruning all the branches off for rubbish collection. My daughter aided me with a pair of clippers, clipping the smaller stuff off so I could get the big stuff off with the saw. 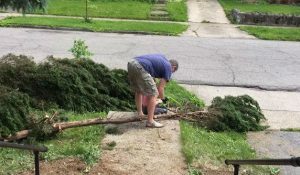 Our city has a policy on yard waste pickup that all pieces need to be 4 feet long or shorter to be picked up, so all the brush was trimmed to that size and is currently sitting on my tree lawn, so we did that work and all that now remains is to get some twine and tie it up into bundles. That’s tonight’s task. Teaching my daughter where to snip off the twigs and branches with the clippers. So my hands are sore (though I did get some great grip training in between the hatchet and the saw). I’m a bit tired. My back’s a bit sore from the work. But I did it, without the use of a single power tool. Did it take longer? Perhaps from a simple “get the job done now” standpoint. But let’s take a look at what I achieved by doing it my way. 1. I got in some awesome movement. I was bending, hacking, cutting, lifting, pulling, squatting, and using pretty much my whole body for a few hours. 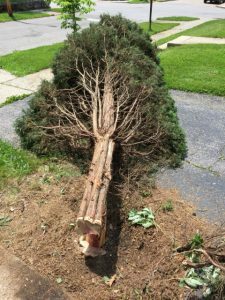 There was big muscle movement with the pulling, cutting, and hacking, and small muscle movement with the twig gathering, cleanup, pruning, and bundling. What the what? Didn’t you just say it probably took a little longer your way? I did say that. But what time did I save? I didn’t have to go to a gym and work out. I was out in the sun, sucking up Vitamin D and breathing fresh air. It was a beautiful day and I took advantage of it. I spent quality time with my kids, and taught them a few things as we worked. My son helped me with the hatchet for a while and learned how to cut logs properly, and my daughter got to dig in the dirt where the bushes used to be and we discussed the bugs that were there. So they were outside with me helping and got that Vitamin D, too. We all got the satisfaction of a job well done and of taking care of our house and environment. I got two new logs for MovNat training for basically the cost of a hatchet, a saw, and a pair of clippers (only one of which was new for that job). We cleared out more space for the herb and vegetable garden that we started last summer in the front of our house. Free food and herbs, right? So let’s take a final inventory. I got exercise, time outdoors, saved money, and most importantly got family time. (And, as my daughter told me, now there’s more room to play in the front yard. Plus, I got tons of compliments from the neighbors about how nicely it opened up our yard. So the next time you have a big job like this and are looking to see how you can make it go quickly, also think of all the things you can bundle into the job. It’s training, family time, health, and money-saving all built into one. It’s not just about the yardwork, thank goodness, but about the ability to just be a bit natural with your whole life. Win-win for sure. How about you? What jobs around the house do you have that you could bundle and make fun and productive for the whole family? How have you embraced the idea of improving life by taking time to do things manually? Share on our message boards! ← Don’t Ignore the Local Races!